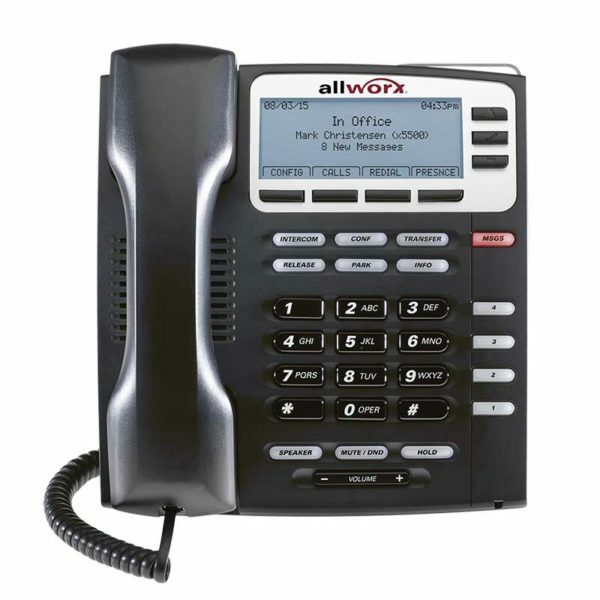 Allworx 9204G 4-button IP telephone is a reliable base model PBX phone. It can be powered by PoE or an AC Power Supply (sold separately). The 9204G 4-button IP telephone provides all the tremendous Allworx functionality at a great price. Speed dial your personal contacts or colleagues in the corporate directory. For colleagues who are also in the Allworx system, you can see their presence setting and real-time call status (active call, active ringing, or do not disturb). Used by call center agents to receive agents to receive incoming calls into their assigned ACD queues. They can also use this button to log in/out and update temporary status (e.g., break, lunch). This feature requires an Allworx Automatic Call Distribution (ACD software license key. barging (supervisor can join the active ongoing conversation). Flashes alternating red and amber colors when 911 is dialed within the Allworx system. Indicates the extension from which the call is made so you can direct the emergency crew to the exact location. Great for shared or temporary work spaces where users must share the same Allworx IP phone. Once a user logs in with a unique extension and pin, that shared Allworx IP phone automatically becomes his/her unique extension. Allows you to monitor parked calls that are waiting to be answered. If you have a multi-site configuration set up, you can monitor parked calls on other Allworx sites as well. Alerts agents when callers in a specific queue have exceeded a specified wait time and/or a specified number of callers are waiting in that queue. This feature requires an Allworx Automatic Call Distribution (ACD) software license key. Useful when you want to share a line(s) among multiple users. Do you and your colleagues want to be able to say “Hi, there is a call for you on line one”? It can be easily set up in an Allworx system. We recommend Allworx AC Phone Power Supplies if you don’t have an AllWorx compatible PoE switch on your network.